No one is buying Rock Band Network tracks on the Wii, so Harmonix is going to stop selling them. It's bad news for Wii Rock Band players, as Harmonix has announced that after January 18th, it will stop providing tracks for the platform via the Rock Band Network. The next update, which features songs from OK Go and Band of Horses, will be the last before the service goes dark. Harmonix launched the Rock Band Network early last year as a way of getting more music into the Rock Band games than the studio itself could supply, by allowing musicians to convert their own songs into playable tracks, and then selling via the Rock Band Network store. The service had a staggered launch, appearing on the Wii much later than on the PS3 or Xbox 360. 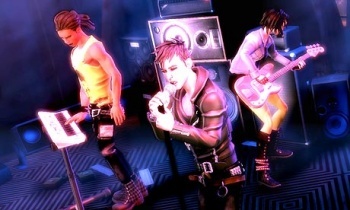 In a post on the Rock Band forums, Harmonix community manager Aaron Trites said that a combination of factors had contributed to the studio making this decisions. The Wii had a smaller online install base than the Xbox 360 or the PS3, and there hadn't been much demand for the tracks since the service launched last September. What's more, getting the tracks to work on the Wii took significantly more work by Harmonix's engineers and producers than the other platforms. While he never categorically stated it, Trites made it pretty clear than putting Rock Band Network content on the Wii wasn't particularly cost effective. It's a shame that the few Wii users who were using the service won't get any more content, but at the same time, you can't blame any company for not wanting to continue unprofitable behaviour - especially not a newly independent studio that reportedly has quite sizeable debts.